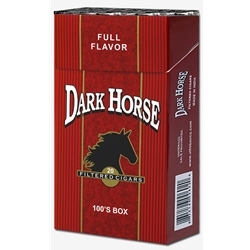 Dark Horse Full Flavor Filtered Cigars offers cigarette smokers an all-natural low-cost alternative packed with premium tobacco wrapped in a micro thin tobacco leaf. Each Dark Hawk Filtered Cigar provides a great smooth taste with a slow burn and pleasant aroma. Dark Hawk Filtered Cigars brings all these elements together at an affordable price. Try a carton today!